Hope you are all well and still knitting. I usually write about my knitting projects but this time I’d like to tell you all about a birthday present of mine from last year. I had this pattern in mind and it mentioned the KnitPro Symfonie interchangable needle set. I looked them up and I liked them. My parents bought them for me for my birthday and I honestly can’t tell you how much I love these needles! They are seriously the best tools I’ve ever used for knitting. Most of the time I don’t even bother with straight or double-pointed needles any more (even with smaller circumferences of circular knitting – but I will tell you all about that in a later post). It comes with 8 of the most common sizes of needles and 4 cables – one of 60cm, two of 80cm and 1 of 100cm – as well as cable end caps and cable keys. You even have connectors with which you can connect the cable wires for larger circumferences. Of course, being quite a serious knitter myself I’ve had to buy extra sizes to add to my collection. One word of warning though; the printed size on the actual needles gets rubbed off with use, hence why I’ve added labels to my bag. This all looks great but how much are they? They are a little bit on the expensive side but honestly they are so worth it and I promise you that you will start wondering how you ever knitted without these needles. After I started using these, I haven’t actually looked at any other brands whatsoever and I’m quite content with that fact. 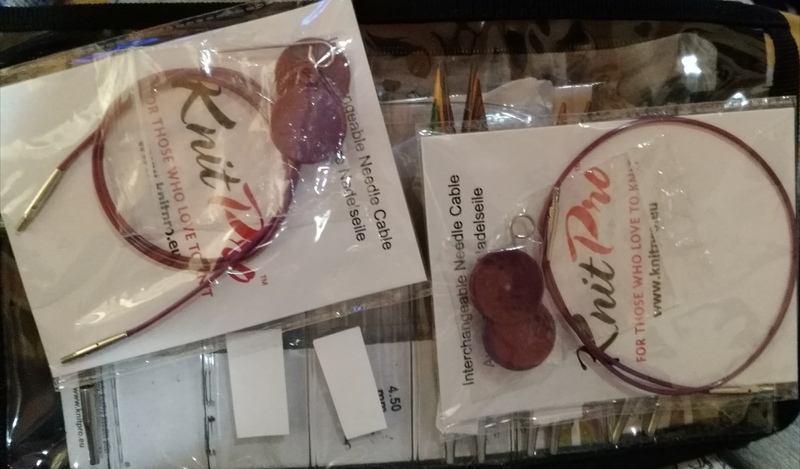 I have officially been converted to the KnitPro brand. They have other great types of needles so if you wish to use metal ones or some other type of material for your needles, you will also find those. You can get this wonderful set of needles here or from this 100% trusted seller instead. Well, that’s all from my side because I truly have nothing bad to say about these needles. Previous I broke my needle! !